Since the humanity started travelling, at first on horses, then on trains and now on ships and planes, we have transported billions of tons of various goods for our different purposes or for sale. Statistic show, that for the last few years freight traffic activity has increased 6.8% worldwide. That means new opportunities and new issues appear in the sphere. 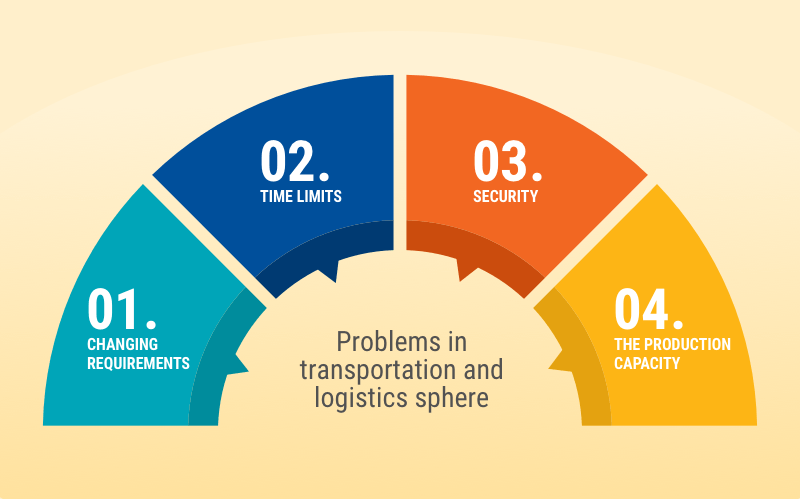 This article is about the most urgent problems in the industry and ways to solve them with the Logistics app development. All these issues can be solved one way or another. We can try to resolve them the old-fashioned way, using calculators, lots of paper and a gatekeeper. On the other hand, why don't we apply up-to-date technologies to modernize the enterprise and to develop an app for Logistics to accelerate our businesses. PROBLEM: The truth is that the rivalry in the sphere is huge and what is needed here is to be the first. Nowadays customers are used to having the best services ever. You have to offer not only the most convenient conditions of the contract but the best treatment of your client as well! You don't dictate terms anymore, they do. And every client wants the logistic service to be tailored or customized personally to them. SOLUTION: Under such circumstances, what the Logistics company has to do is to provide a client with the solution, which would satisfy all parties. The answer can be a Logistics management application, or a web-based platform, with the ability to track parcels, calculate the arrival date or cost of storage, have different payment methods and a delivery service. If the company stores or transports perishable and fragile commodities, the customer needs to be able to indicate what temperature, humidity or pressure is needed for their cargo. However, what is even more crucial is to make the transportation and Logistics mobile app transparent and userfriendly. The Logistics app has to replace real consultants and give the user a comprehensive body of data about the services they pay for. PROBLEM: Logistics are always time limited and not even a second can be wasted. In the supply chain sphere, you need to deal with transport breakages, traffic jams, workers strikes, national holidays or celebrations, weather, and even the religion of your employees. Despite all of these, there is an expiry date, goods vicinity principles and many other issues. All these factors influence on the delivery and cargo dispatch time. Optimize the route. The less time that's needed for cargo transportation the better. To achieve this you need to arrange the shortest route omitting jams, road works and mad miles. Cut time for documentation filling. All the materials have to be formed automatically and require minimal human interaction. Minimize manual work. The more robots you have, the fester the job gets done. One more plus of the automatization process is that you reduce the probability of mistakes and consequently, industrial accidents. Real-time reports created by an automated system helps to cut time for cargo slotting and dispatch. PROBLEM: The market is unpredictable. To calculate the capacity you need to forecast global economic changes, because overcapacity is just as bad as undercapacity. SOLUTION: What you really need here is nice analytical functionality. If you have this feature in your app for Logistics, you can foresee the growth or vice versa a decline of the production capacity. Having all data in hand, it is much easier to either expand the production or not. Supply Chain Visibility Analytics. The system allows you to control all the events and to manage them accurately. Exception Visibility Analytics. Here you can see all the data connected to the acceptance procedure. Procurement Visibility Analytics. The software collects all the documentation and materials about cargo catering. Manufacturing Visibility Analytics. If your business is connected with the production, or the data collected, then this block will show you what is needed for loading and dispatch for efficient, sustainable work. Transportation Visibility Analytics. The information shows all shipments, time, cargo and weight. Fulfilment Visibility Analytics. Allows you to see what has been accomplished daily, monthly, weekly and yearly. The extensive information is as important as equipment, workers and materials. In good hands, the info advances the complex procedure of a supply chain management. PROBLEM: Being transported, cargo passes through eight or nine different sets of hands, which means that someone should keep an eye on the commodity. The people you hire, the transport you use as well as the warehouses you store the goods in should be reliable, modern and secure. And the list of problems cannot be limited only to thefts. The health conditions of the workers as well as stockroom wiring and even the brakes in the truck is your headache! If the employees work long hours under hazardous conditions, the possibility of injuries grows. To prevent it, mobile Logistics solution can replicate some features from fitness and wellness applications. In particular, pulse rate tracking. For better performance, different wearables can be used. Moreover, with modern technologies, you can see what time each worker came and how he or she moved around the office/warehouse. To protect the storage facilities, we can apply the same technologies as in Smart Houses. The IoT is a great way to control all the needed conditions (like temperature and humidity inside the storage structures) and to block break ins. The application synchronized with a truck's on-board computer controls the speed, fuel level, travel time, route and other figures. The data is needed not only for analytics and efficiency improvement but also to avoid breakages and standstills. Should you develop an app for Logistics or not? 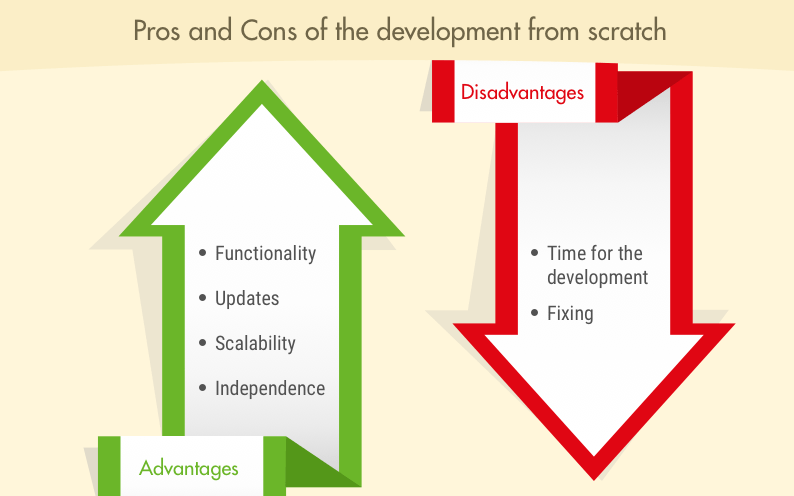 At first sight, the purchase of a ready made solution seems to be a better idea than the Logistics app development. To persuade or dissuade, we've listed some pros and cons of both paths. The time. You save time because you buy an off the peg product. Lots of features. Modern solutions have all the functionality needed, along with analytics, tracking and planning features. No bugs, no crashes. Choosing the system, you would read tons of comments, rates and top lists and would choose the program which has already been tested, so the chance you'll experience a system crash is minimal. Customization. Despite the fact that the system has tons of useful features, you would need to adjust it to your needs. In that case, you need to add your own features to the system and you would face lots of difficulties or even find it impossible to be performed. Expenditures. The program costs money. Before you buy anything, calculate the total sum, whether you pay once or monthly. The other option is to develop a mobile Logistics solution specifically for your enterprise, including only the functionality and technologies you need. Functionality. The Logistics apps for android or for IOS which you create for your business is going to become the answer to all the issues of modernization and automatization for your business. It will include only those features which you indicate, and won't have to pay for those which you aren't going to use. Updates. New features can easily be added whenever and however you want it. Not only that, the functionality you think isn't necessary anymore can be cut down. Scalability. With the SAAS you commonly pay not only for the system you use, but also for each person who uses it. In the case of your own mobile Logistics solution, you can add as many workers as you need. Independence. If the company that provides you software services closes ,you need to look for another provider. Having your own mobile device Logistics app, you don't need to rely on someone. The time needed for the development. Yes, you will have to spend a little bit more time for the planning stage to get the product you need. Fixing. It is possible, that the raw product can have a few bugs, which are seen only after a few months of active use. However, these bugs or imperfections of the system usually take little time to fix. The question here is not "to modernize or not to modernize", the question is what path to choose and how to advance your business. If you prefer a custom mobile Logistics solution for development, contact us and get more useful information.